Nota bene: Friday Favorites posts contain some affiliate links. I’ll receive a small percentage of the sales made through the use of those links below. Thanks! I love the embroidery on this top. I so desperately wish we had a bath tub. I love a good salt soak, like this one from Herbivore Botanicals. Say hello to Teami teas! Their Relax blend contains lavender, chamomile, lemon grass, orange peel, and valerian root extract. Yes, please. To save 10% on your Teami order, use the code GIRLDUST at checkout. These silver earring jackets from Species by the Thousands are effortless and beautiful. Sea Bags are made from recycled sail cloth on the working waterfront in Portland, ME. Home sweet home. Look at this sea turtle wristlet! I love the gold geometric pattern on the Desert Skies infinity scarf from Rythmatix. Products are made in the US with organic fabrics. These come in a few different colors, but the print looks so great on cream! This mossy green kaftan from Free People is totally dreamy. Sometimes I wish summer lasted just a bit longer. Welcome Friday! I started writing this post from the comfort of our back deck. It’s been a long while since I’ve had a computer that could actually be considered portable, and I’m definitely warming to the idea. We’ve yet to find ourselves a comfortable set of deck chairs, but I’m happy for the moment to take advantage of the sunshine in a stowaway camp chair. I’ve got cold brew coffee, and a wild cat companion at my feet. It’s a good morning. We put a lot of work into this corner of the backyard over the last week or so, and it’s already paying off. 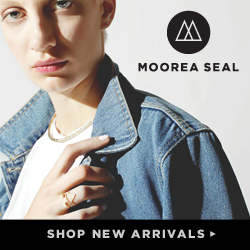 These moon earrings by Merewif from Moorea Seal are killer. The aqua sunglasses from Rainbow OPTX are perfect. I’m actually really into most of the transparent frame options! Which is your favorite? I’m newly obsessed with Pura Vida bracelets. Every bracelet purchased helps provide full time jobs for artisans in Costa Rica, and Pura Vida has also teamed up with some great conservation charities (including Shark Savers). Obviously, I’ve signed up to a rep. Receive 20% off your Pura Vida order using the code NAOMIDENSMORE20 at checkout. New papaya pineapple lip balm from Hurraw! Give me ten tubes, thanks. Also, if you’re worried about your lips this summer, the SPF 15 balm balm is just great. It’s one of my favorites, and it smells like tangerine! Celestite is known to soothe anxiety. I have one or two small tumbled specimens, but this raw crystal cluster is stunning. I really love elephants. I have been known to cry in their presence. To be honest, I get emotional about a lot of animals. This will probably never change. This cute and comfy looking tank top is made in the US. I would love to get my hands on this Toshio Saeki (aka the Godfather of Japanese Eroticism) anthology book. The product description at Magic Pony covers the bases, if you’re unfamiliar with ero-guru. NSFW. My hometown newspaper is holding an essay contest to find its new owner. Yes, this is real. Get to it! How Modern Women Are Reclaiming the Occult. I like this. As part of the Megacities Asia exhibit, the MFA Boston is offering free admission to anyone who takes a photo with Choi Jeong Hwa’s Fruit Tree at Marketplace Center near Faneuil Hall. The exhibit runs through July 17. I haven’t shared monthly goals since February, so it seems as though actually blogging ought to be on my goals list. I am making a mental note of it. It is noted. But let’s talk about summer. The sudden sunshine is motivating. Set up my laptop. Tj recently bought a new laptop, so his Macbook Pro has been handed down to me. I’m a little over my head; it’s much newer than any computer I’ve used in the last few years, and it’s been literally over a decade since I’ve used a Mac. To write this post, though, I’ve already had to switch computers (twice) and email photos to myself, which just isn’t sustainable. Or necessary. I need to move my files, and I definitely need to make a software decision or two. Do you use Adobe Creative Cloud? How do you feel about it? I’m almost 100% certain that the Photography plan (which includes just Photoshop and Lightroom) will be more than enough to do both blogging and internship work. Reach out to brands I want to work with. Aaaah. This is a big scary one. I actually emailed some companies today, and I was a giant ball of nerves before hitting that “send” button. But here’s the thing: I realized that I would much rather reach out to the companies I already love, support and promote in real life, than wait for random brands I have no feelings for whatsoever to reach out to me. If I make an effort, and am kind and genuine, something good may come from it. Or it won’t. But certainly nothing bad is going to happen. Get. In. The. Water. We didn’t really surf at all last summer. Or, I certainly didn’t. My surfboard hasn’t really been touched since I moved into the house. There were a lot of things holding me back. At the moment, I think I’d be happy just to float and paddle and probably fall off the board a few times, so really there’s no excuse not to go to the beach. Date night. Have I mentioned that Tj is leaving for four weeks at the end of July to work at the Olympics? And how that is a little bit (or… how about very) surreal and stressful? Four weeks is a long time, and Brazil is very far away. I feel like we definitely need to fit in some quality, device-free time for ourselves. And good food. And probably some wine. It’s not here yet, but August is going to be a little difficult. I’m trying my best to stay in the moment, but it’s not easy. I will definitely be making an effort over the next few weeks to enjoy these days as they come. Summer moves so quickly. Just how many millennia has it been since I posted a manicure of the week or a polish review? This one is exciting! This bright pink shade from Trust Fund Beauty is going to be on my fingers all summer long. Hot in the Hamptons is a hot, hot pink with a touch of shimmer. Even though I’m normally a neutral polish kind of girl, this is a dose of happiness every time I look down at my hands. I can’t get enough. It’s nice to have a bright color in my polish arsenal. I’m a little out of my comfort zone, in a good way. Pink is secretly (sometimes) one of my favorite colors. Don’t tell. I’m complicated. Non-toxic and cruelty-free beauty is incredibly important to me. I have a strict set of standards when it comes to my infrequent (but enjoyable and necessary) cosmetics and body care purchases, and with so many options available, in all price ranges, there’s no reason not to be picky. I’m so happy to have discovered this company. While there are now quite a few toxin-free nail polishes on the market, Trust Fund is now officially in my top three (along with LVX and SpaRitual). What polish colors are you wearing this summer?